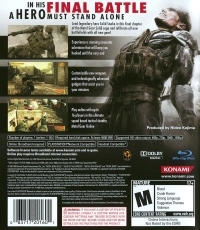 Box Text: In his final battle, a hero must stand alone. 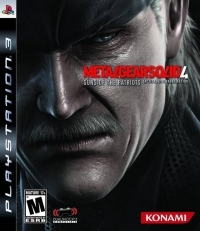 Lead legendary hero Solid Snake in this final chapter of the Metal Gear saga and infiltrate all new battlefields with all new gear. Experience a stunning cinematic adventure that will keep you hooked until the very end. Customizable new weapons and technologically advanced gadgets that assist you in your missions. Play online with up to 16 players in the ultimate squad based tactical shooter, Metal Gear Online. 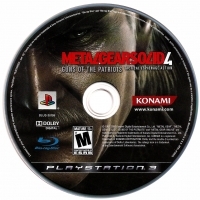 This is a list of VGCollect users who have Metal Gear Solid 4: Guns of the Patriots in their Collection.